How do I get started as a pup? Get on all fours and start barking! It is not always easy for a pup to get started with his puppy headspace. All pups are different, so what works for one may not work for others. The most useful thing may be to try and think like a dog thinks. Read puppy training guides, especially if you’ve not owned a dog, or haven’t in a long time, it will help give you some insight into how a dog would react to a situation. As a pup you will also need to learn your pup voice and non-verbal forms of communication. Generally speaking there are very little worries when you are a puppy. You crave attention and will seek it however you can get it! Remember though that pups don’t always have to chase balls! There is a special bond that can be found between Handler & pup just by putting your head in his lap while he gives you ear scratches. How do I get started as a Handler? For the most part, when you are handling your pup treat him how you would a biological puppy. Pat him, play with him, tell him he’s a good boy. There is no thing greater than having the joy and love you give your pup reflected back to you from a wagging tail and a lick on the cheek. Remember though that you need to maintain dominance, by showing you are pack leader, or your pup will get out of control. Use positive reinforcement to train your pup. Giving attention to negative behavior will not work in your favor, because a pup only wants attention, and will see this as a game. (humans learn tricks too fast 😛 ). Do keep in mind however that your human puppy is not the same as a biological one and cannot do all of the same things his counterpart can. Should I give my human pup dog food? This question comes up a lot from those starting to get into puppy play. Despite what you may have heard, animal dog food is not fit for human consumption. Besides not meeting the dietary requirements of humans, there are many components such as bone meal and animal byproducts in dog food that simply aren’t digestible by humans and could make your pup sick. There are plenty of human foods that can serve as a substitute dog food. Cookies, crackers, anything bitesize your pup enjoys may be usable as treats. Cold canned beef stew is a perfect analog for wet dog food. Certain breakfast cereals look a lot like kibble (dry food). You can be creative and make your own food and treats. Personally my favourite foods are spaghetti bolognese, Lamb shanks in a gravy and steak. If you are going to have your human pup eat from a dog bowl then you either allow them to use a knife and fork or cut their food up in bite size pieces… Communication is key here. As Human pups essentially are human the pup will find it difficult to eat from a bowl on the floor, the bowl would need to be raised on a chair or stool if you are going to have your pup eat on all fours, this is so the human digestive system can work as it is meant to, and prevent your human pup from chocking. Remember as the handler: Safety first. Remember teaching a human pup new tricks is similar to teaching a biological pup, both corrective actions and positive reinforcement is required. These are only some things you can do, use your imagination and creativity when training your pup. 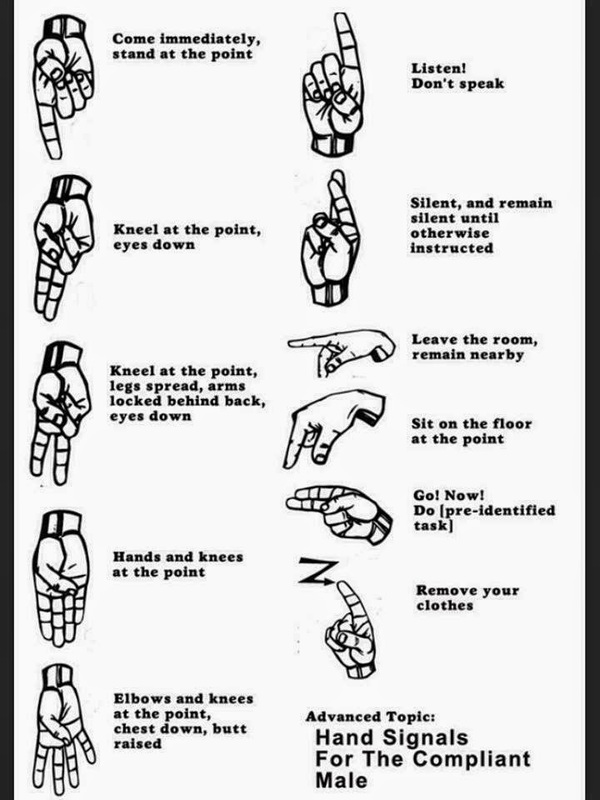 As a handler you will also need to learn forms of non-verbal communication and hand gestures, and then you will need to teach them to your human pup. There is a lot more to being a handler then many realize. What is needed for puppy play? For most, puppy play is primarily a headspace. It is about a pup mentality, where your world consists mainly of what’s within four feet of the ground. Puppy play is cheap and can be done with a minimum of gear. That said, there is some gear that helps maintain headspace. Collars – A collar may be the most important part of gear for a pup. Besides providing a place to put a leash and a tag, wearing a collar helps immensely in putting a pup into the proper headspace. Unowned pups should not wear tags. Kneepads – A more practical consideration than anything, a cheap pair of kneepads from home depot will help keep your pups knees from being chewed up and allow for longer play. Paws/Mitts – Paws help keep a pups hands restrained, preventing them from being used like a humans and also serving to protect hands during play. Hoods/Muzzles – A muzzle helps prevent a pup from using his human voice, and serves to make him look more dog like. Hoods look even more dog like (some are very realistic) and are usually less restrictive. Toys – Every pup needs some good chew toys to chase. The best toys are soft, human teeth are not dog teeth. Hard toys like bones and rawhide shouldn’t be used. Rope toys are OK but should not be tugged on hard. Bowls – A large dog bowl is best. A human pup’s snout isn’t as long as a real pup’s. Best way to measure is to stick your face in and see if it fits!